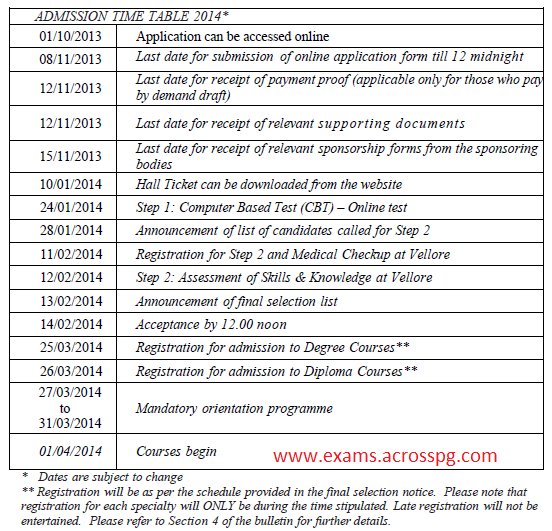 CMC Vellore Postgraduate Degree/Diploma Admissions 2014 notification - AcrossPG Exams! Application forms can be accessed only online through the Christian Medical College website http://www.admissions.cmcvellore.ac.in from 1/10/2013. Duly filled application forms must be submitted online with a basic administrative fee of Rs.750/- and a registration fee of Rs. 600 per each course before 12 midnight on 8/11/2013. All the supporting documents should reach the Office of Registrar, CMC, Vellore -2 by post on or before 12/11/2013. Candidates applying from SAARC countries should send a Demand Draft for Rs.1500/- or its equivalent and those from other foreign countries, US dollars 100 or its equivalent as administrative fee in addition to the registration fee per course. 2. Demand draft in favour of “C.M.C. Vellore Association a/c” on any Scheduled Bank, payable at Vellore. Keep your demand draft ready before filling the application form. Write your name and application number on the back of the demand draft before dispatching. Special Thanks to Navin Chandar for sending us the information.